If you’re anything like us, then you’ve been keeping a close watch on what is possiblythe next big thing in tablets — the Microsoft Surface. And again, if you’re anything like us, you’ve also been growing impatient at the lack of official details from Microsoft regarding how much this newfangled device of theirs will cost. Good thing people are still in charge of updating websites because it looks like someone just hit the wrong button at Microsoft’s offices and accidentally revealed the pricing details for the Microsoft Surface tablet. First off, we’d like to thank all the quick-thinking people out there across the Interwebs that managed to snag screenshots before these pages were taken down. If it weren’t for you, then we wouldn’t know that pricing for the Microsoft Surface starts at $499. This price for their entry level tablet puts it more or less in the same bracket as the entry level offerings from Apple, Samsung and Amazon. Looks like Steve Ballmer and Co. aren’t trying to win over support by making the Microsoft Surface cheaper and expect people to pick it up purely based on what the device is offering — a colorful alternative that runs Windows 8. 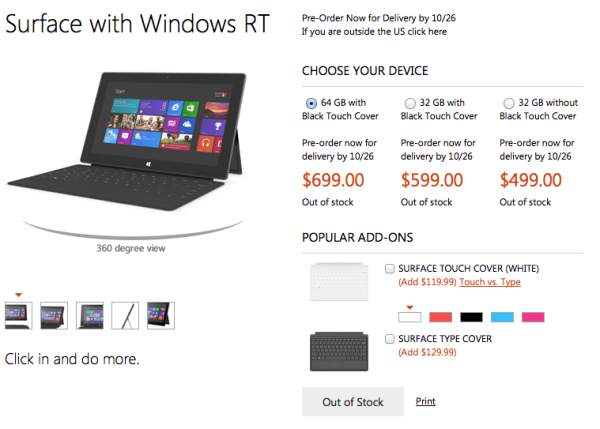 Before we forget, the $499 doesn’t include any of the Touch Cover versions. You’ll have to shell out an extra $100 for the touch-sensitive keyboard. For users who like the feel of actually pounding keys, you’ll have to cough up $130. This brings the total of a complete entry-level Microsoft Surface tablet set to $600-630, depending on which keyboard you choose. At that price, you can already get yourself three Google Nexus 7 tablets and with a few dollars left over to spend for accessories. I’m all for Microsoft shaking up the tablet market, which is why I supported them when they announced the Microsoft Surface, but these prices seem crazy high considering what other manufacturers are offering. Are you planning to get a Microsoft Surface tablet? What do you think of these prices? Discuss in the comments below!